MOVIE SYNOPSIS: In the adorably different town of Uglyville, weirdness is celebrated, strangeness is special and beauty is embraced as more than meets the eye. After traveling to the other side of a mountain, Moxy and her UglyDoll friends discover Perfection -- a town where more conventional dolls receive training before entering the real world to find the love of a child. 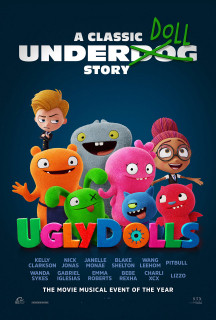 Soon, the UglyDolls learn what it means to be different -- ultimately realizing that they don't have to be perfect to be amazing.